With the 150th anniversary of the 1st Battle of Bull Run, and with all of the events and festivities in the Washington D.C. area, I thought I'd reflect a bit on this battle and the subsequent battle in August of 1862 (2nd Battle of Bull Run) and their effects on John. After the initial wave of 90 day "First Defenders'" enlistment had expired and after the 1st Battle of Bull Run there was a sense in the North that the war would not be as quick and romantic as originally anticipated. A new wave of recruitment and enlistments began in July of 1861, which fielded many more men and a series of regimental reorganizations. Those that had been in the initial "First Defenders" wave and re-upped their enlistment, were mostly reorganized into newly formed regiments. Though John was not part of the first wave of enlistments, I believe he was influenced by neighbors and friends who were part of the "First Defenders", as well as the disastrous events of 1st Bull Run. His first few letters show a man who was ready for adventure and caught up in the wave of patriotism. I am excited and a bit impatient to share the 2nd Bull Run letter with all of you. It is probably my favorite and is filled with information that has given me many hours of very satisfying research. During this battle, as part of the 48th, he was wounded, taken prisoner and eventually paroled. This short letter provides subsequent clues, links and questions that I have been researching for years. Fortunately, with the internet, the research activities are much easier and more accessible that when I started this project many years ago. 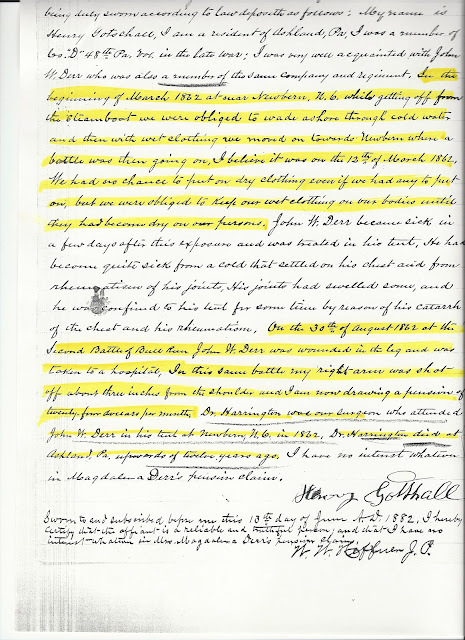 Back in the 1980's I spent some time at the National Archives photocopying John's military and pension records along with other Civil War ancestors. If you are ever inclined to do a project such as this, the Archives is essential. I have found more information that provides more links and clues, than anything else. For example, in John's case, his widow's pension request from 1878, provides affidavits from family, friends, and fellow soldiers. 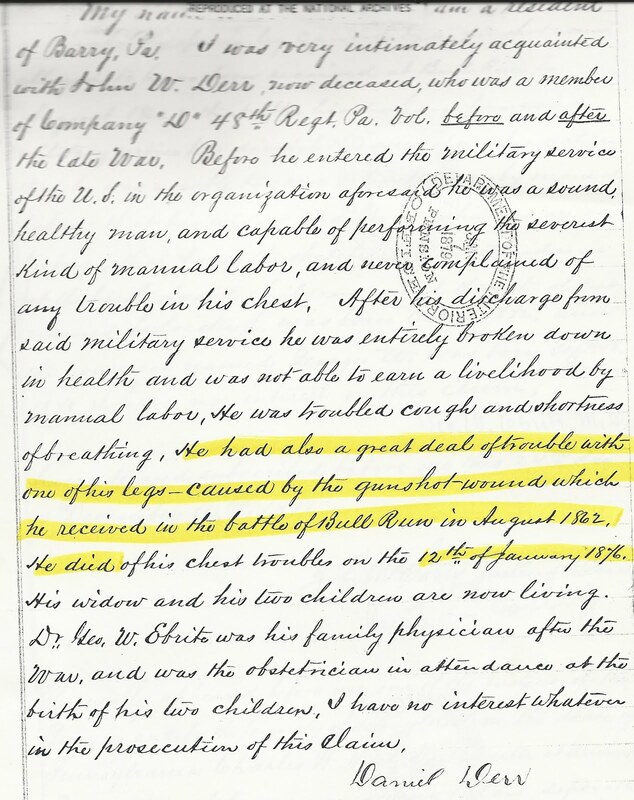 It has allowed me to understand better the character and condition of the man who was my great great grandfather. Last night, I sat down and re-read the pension application affidavits. 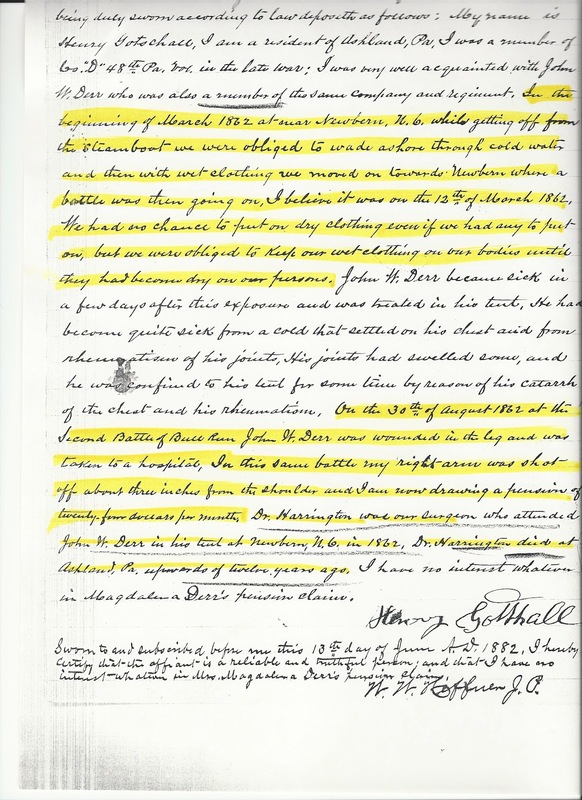 There were numerous signed documents from fellow soldiers attesting to the character of John. Some of them were very touching.